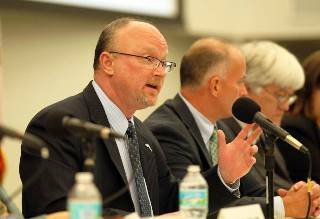 TALLAHASSEE -- After more than a decade as Florida’s chief insurance regulator, Kevin McCarty resigned Tuesday, nearly a year after he overcame a failed effort by Gov. Rick Scott to get rid of him. McCarty invited reporters from the Herald/Times and two other news outlets to his office to break the news of his departure, which is effective May 2. “Sometimes it’s good to leave on top,” McCarty said. He noted that the property insurance market has stabilized and said he’ll leave on his own, not under pressure from Scott. But in a private meeting with Scott in October, McCarty had made clear his plans to look for another job, he said Tuesday. By staying in the job until May, just before the start of the hurricane season, McCarty said he’ll be able to review all insurance legislation out of the 2016 session that opens next week and make recommendations to Scott. McCarty did not disclose his future plans. He is considered a leading candidate to be the next chief executive of the National Association of Insurance Commissioners (NAIC), where he once served as president. Kevin McCarty speaks at a public hearing for Citizens Property insurance rate increases. “I certainly would like to be in a position on the national stage or on an international stage where I have spent a good part of my career,” he said. McCarty, 56, is the state official who decides how much money homeowners in Florida pay for their property insurance. Over the past decade, he has repeatedly borne the brunt of criticism for increased rates charged to Floridians, and for controversies involving the powerful insurance industry. By far the biggest shot came 20 years ago in a harrowing ordeal in which Bankers Insurance Co. of St. Petersburg secretly tapped his telephone, followed him and investigated his personal life after what it said were unfavorable regulatory dealings with the state. McCarty won $2.55 million in an out-of-court lawsuit settlement in 2000. He disclosed for the first time Tuesday that he used some of that settlement money to buy his mother an oceanfront condo in Sarasota which, he noted, is in a high-risk coastal zone, vulnerable to storms. At least twice he survived calls for his ouster from legislators in both parties who criticized his handling of industry rate increases. In 2003, McCarty became Florida’s first appointed insurance commissioner, after voters approved changing the position from an elected Cabinet-level post. McCarty served three governors and helped steer the state through a series of devastating hurricanes, ending with Wilma in 2005, while also seeking to protect consumers, many of them elderly, from unscrupulous peddlers of insurance products. McCarty shrewdly navigated the capital’s perilous politics for an extraordinarily long time, but was seen as vulnerable after Scott took the oath as governor for a second time one year ago this week. Weeks after Scott engineered the removal of Gerald Bailey as the state’s top law enforcement official, an action the governor later said he mishandled, Scott called for a new insurance commissioner, without a critique of McCarty’s record. Scott’s office already had a replacement in mind: Ron Henderson, a state insurance official in Louisiana who was being pushed by Fred Karlinsky, a Tallahassee lobbyist for insurance interests and a Scott supporter. But consumer groups rallied to McCarty’s side, and in the furor following Bailey’s ouster, which included public criticism of Scott by Cabinet members and a lawsuit by media outlets, another controversial personnel move by Scott became politically impossible. McCarty earns $134,000 a year in his dual role as insurance commissioner and director of the state Office of Insurance Regulation. His successor must win the support of both Scott and Chief Financial Officer Jeff Atwater in a vote by the governor and Cabinet. The next scheduled Cabinet meeting is Jan. 21. McCarty is the last surviving high-level appointee who has served continuously since Jeb Bush was governor. Bush left office in 2007. “What our office did was provide a steady hand in providing a path forward that didn’t go too far in any direction,” McCarty said Tuesday. He predicted that a sharp increase in water damage claims in South Florida, a trend clouded by allegations of fraud, will be a persistent problem. Partly as a result of those claims, McCarty’s office approved rate increases for state-run Citizens Property Insurance Corp. that take effect Feb. 1. A persistent critic of the federal Affordable Care Act, McCarty said it has expanded the number of people who have health insurance, but with high deductible costs for prescription drugs. McCarty’s departure will leave vacant one of state government’s the most challenging jobs because of the political volatility surrounding the cost and availability of insurance in a state that is highly vulnerable to catastrophic hurricanes and ever-present insurance fraud. “It’s been a state of fraudsters and hucksters,” McCarty told the Insurance Journal in a recent podcast interview. McCarty said a top deputy, Belinda Miller, is highly qualified to succeed him, but that the decision rests with Scott and the Cabinet, which oversees OIR in its role as the Financial Services Commission. He said Scott and Cabinet members would likely conduct a national search. McCarty’s resignation follows the departure of another state agency head Scott wanted out, Marshall Stranburg at the Department of Revenue. Scott last year also sought to replace chief banking regulator Drew Breakspear, who recently underwent a successful Cabinet review of his job performance.